Yes, it's that time of year again! 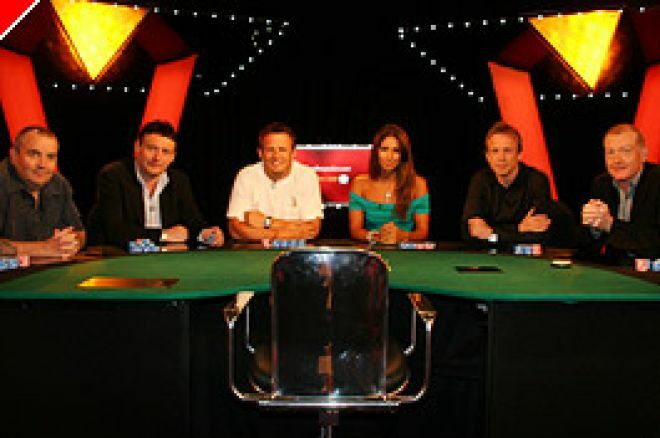 The Ladbrokespoker.com Poker Million V kicks off with weekly screenings of heats for the next three months before the Grand Final, screened in full as it happens, on 15th December! There is an ultimate first prize of $1,200,000 for the winner, and Ladbrokes Poker has added $1,000,000 to the prize fund. Some of the world's best players are competing in the heats and every one of them can be seen on Tuesday nights between now and December on Sky Sports 2. To kick things off, the infamous "celebrity heat" gets its initial TV showing on Tuesday, 19th September, at 10pm. In last year's edition, we saw a spectacular performance by Helen Chamberlain, the SoccerAM presenter, putting Barry Hearn to the sword with some bravado playing, a trend she took to the heat proper which she also won, before coming so close to winning the Grand Final. Chamberlain won $400,000 for second place and has since bought a racehorse with the proceeds. Chamberlain had "Mad" Marty Wilson to thank for a crash course in short-handed poker last year so will he be on hand again to coach any of this year's line-up? Marty is a regular fixture at Ladbrokes events so it would not be a surprise. Tim Lovejoy, who is Helen Chamberlain's co-presenter at SoccerAM, has been tempted to follow in her footsteps so he may need some help as he will not live it down on SoccerAM if he fails! The favourite is surely Steve Davis, a cash finisher at the World Series of Poker in the summer and probably the most experienced player from this line-up. Nonetheless, in a one-off single table satellite, anything can happen if the cards are in the mood. We also should not forget that Jimmy White won the second Poker Million in 2003 so he is another who will not be afraid to go all-in where it matters. The winner of this celebrity qualifier secures a seat in one of the twelve main heats. In turn, the winners of those heats qualify for a place in one of two semi-finals which require a different type of strategy. This is because the semi-final performance can be instrumental in winning the whole event. Finishing in the first three places in each semi-final gets each player to the final table but the player carries forward his chip count that he has in front of him at the moment the 4th place player is eliminated. Early accumulation of chips is therefore vital. The semi-finals are held on 13th and 14th December and these too will be shown live on Sky Sports! So, to mix up the gaming metaphors, it's eyes down looking on 19th September for the first of many Tuesday evenings of essential viewing. Ed note: There's over $1,000,000 of guaranteed prizes at LEOCOP from 25th September. Download Ladbrokes Poker for the chance to qualify.